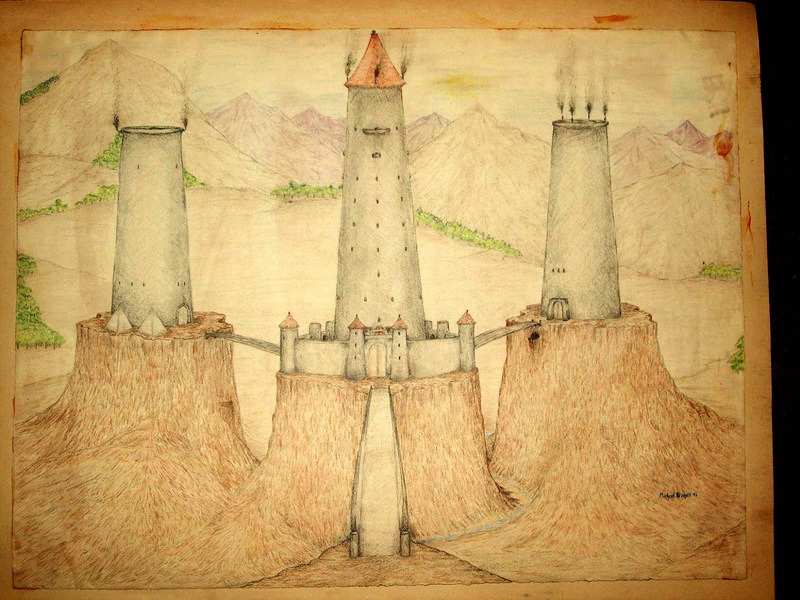 It was a time long ago, when Old Greyhawk Castle was 13 levels deep. "The first level was a simple maze of rooms and corridors, for none of the participants had ever played such a game before. "The second level had two unusual items, a Nixie Pool and a fountain of snakes. "The third featured a torture chamber and many small cells and prison rooms. "The forth (sic) was a level of crypts and undead. "The fifth was centered around a strange font of black fire and gargoyles. "The sixth was a repeating maze with dozens of wild hogs (3 dice) in inconvinient (sic) spots, naturally backed up by appropriate numbers of Wereboars. "The seventh was centered around a circular labyrinth and a street of masses of ogres. "The eighth through tenth levels were caves and caverns featuring Trolls, giant insects, and a transporter nexus with an evil wizard (with a number of tough associates guarding it. 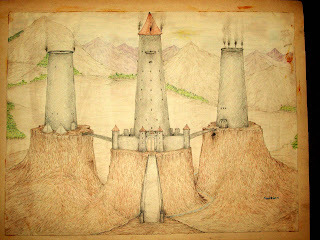 "The eleventh level was the home of the most powerful wizard in the castle. He had Balrogs as servants. The remainder of the level was populated by Martian White Apes, except the sub-passage system underneath the corridores (sic)which was full of poisonous critters with no treasure. "Level twelve was filled with Dragons. "The bottom level, number thirteen, contained an iescapable (sic) slide which took the players 'clear through to China', from whence they had to return via 'Outdoor Adventure'. It was quite possible to hourney (sic) downward to the bottom level by an insidious series of slanting passages which began on the second level, but the liklihood (sic) of following such a route unknowingly didn't become too great until the seventh or eighth level. Of the dozen or so who played on a fairly regular basis, four made the lowest level and took the trip. . .
We don't see many Wild Hogs in the dungeons anymore. Explains the "Giant Hogs" on the 3rd level Wandering Monster Table in OD&D, Vol 3. Sounds really nonsensical and not at all like an example of Gygaxian Naturalism, but it does sound like it would be a ton of fun. I've never been able to enjoy straight-up "maze" style areas. What's your source on the quote? Giving away all of my secrets there Grodog. Soon they'll all be mine, and then I'll inherit your power. Very interesting stuff. Gygax himself of course evolved, along with everyone else. Over at CRPGAddict pretty much all the early computer RPGs involve the (unexplained) many-leveled dungeon with monsters and traps. Just wait until Castle of the Mad Archmage comes out later this year. Lots of this sort of goodness therein. I recall you had some kind of agreement that would run out it May - does that still hold, so that we can expect it in a couple of months? "May 2013 is the hard deadline, after which time they lose the right to publish." I want a shirt that says, "Level twelve was filled with Dragons." About the hogs, as a farmer I can assure you that hogs will eat pretty much anything organic up to their own size, bones and all, with the exception of the skulls and feet. I figure the pig level was a sewer-offal pit for the first several levels of the dungeon. Did gelatinous cubes exist yet?